Can Powderwhore Save the Ski Film? If you ask me, brothers Noah and Jonah Howell, a.k.a. the Powderwhores, appear to be in the midst of a transition phase. 'Choose Your Adventure' is their latest film, and in it they continue to demonstrate how accomplished they've become at shooting skiing. Year after year, the whores take their camera and their Mac and they churn out ski films that increasingly rival the polish on the very slickest of big budget operations. And yet, as they continue to flex their filmmaking muscles, I get the sense that Noah and Jonah have been brooding over whether it is enough to just get pretty shots of pretty skiing and call it a day. They're good at that—don't get me wrong. But chasing pretty pictures as an end in itself increasingly feels like a dead end to me, and I wonder if that same thought has struck the Howell brothers. 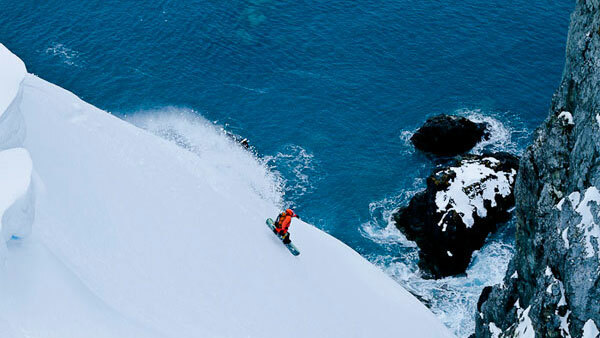 'Choose Your Adventure' is Powderwhore's most experimental film to date. Its segments are diverse and different—often very different in terms of look and tone and feel. This does make the film a bit uneven from start to finish, but taken as a whole, CYA clearly represents an effort to not just rehash or even expand what Powderwhore Productions already does well, but rather explore new territory. Part of the change in this year's film could simply be the result of the adversity of the 2011-2012 Winter, which brought a major injury and not much snow to the Powderwhore team. You might expect a winter like that would lead to a more serious, more introspective film, and you'd be right. But I also see a real interest in storytelling appearing in 'Choose Your Adventure.' The Howell brothers seem determined to bring us not just skiers but people—real people, with real stories. This more character-and-story focused approach isn't uniformly successful, but when it does hit it does so solidly, pointing the way, perhaps, to something with a little more depth and longevity than just an endless stream of highlights and music. I'm thinking in particular of the film's Antarctica segment, which combines technically-thrilling photography with a wry documentary style that really transports us into the scene. Above all else, this part of the film connects. Look, the dark side of today's egalitarian movie business is you can make a lot more money shooting cats with your cellphone than you can making time and effort-intensive, niche-sport documentaries. If you're going to survive a labors-of-love career in the YouTube era, you can't keep making the same film over and over. That's how I see it, at least. Maybe the Powderwhores are grappling with similar thoughts. Some Powderwhore fans may find 'Choose Your Adventure' less easy to cheer, more spotty than previous highs like Television. But I see it as a very promising bridge between old and new. Beyond a doubt, the Howell brothers are showing us they can do more than just fire up the stoke: they can take us on a journey. Let's hope we see more! For tour dates, trailer, or to buy a copy of 'Choose Your Adventure', visit Powderwhore Productions.